NES Bad Dudes (USA) in 13:25.36 by Kirkq. "The President has been kidnapped by ninjas! Are you a bad enough dude to rescue the President?" 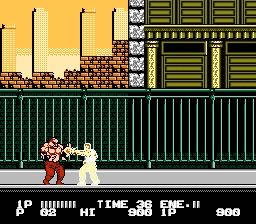 The answer is a resounding "yes", though we're not sure if Karnov counts as a ninja or not. In this run, Kirkq utilizes obscure and unusual jump patterns to move quickly. During the game's lengthy scrolling sections, optimization shifts more toward entertainment.